If we were a bottle of wine, you might call us vintage. We’ve been around the industry for quite a while now, and we’re proud of our history, experience and accomplishments. Our founding was in November 1987 when Kevin Burke purchased local Miller distributor Dixie Beer. Having been in the beer business since the late 60’s, he recognized the opportunities that existed for someone with his experience, expertise, and commitment to great customer service. Within a few years, the business had outgrown its original building and a new facility was commissioned and built in southwest Louisville. This state of the art facility was built with expanded technological potential and a focus on product quality. Featuring over 150,000 square feet of temperature controlled warehousing, a refrigerated draft cooler, and 2 floors of office space, the building was a welcome change from the old, cramped quarters we had outgrown. Over the years, the company grew steadily as new brands and products were brought to the market. In 2007 we acquired Mo Moorman Distributor and grew our volume by nearly 50%. This acquisition propelled River City into an even stronger market position and forced us to expand our warehouse in 2009. By focusing on the needs of our customers and the dynamics of our market we came to the realization that many customers were being underserved when it came to unique, quality wine and craft spirits. With this in mind we launched our Wine & Spirits division in 2011. This addition to our portfolio has allowed us to offer a complete selection of beverage alcohol for all of our customers. We’ve taken the time to grow and expand with care, learning the market’s needs every step of the way. We know the locals’ tastes, because we’re locals. River City Distributing Co. Inc. will be permanently closing its facility in Watertown, cutting more than 100 jobs. In a letter to the Wisconsin Department of Workforce Development (DWD), River City said it is selling substantially all of its assets to Madison distributor Wisconsin Distributors (WDI LLC) of Sun Prairie. The DWD reported Monday that the closing is expected to result in the permanent elimination of approximately 72 full-time and 35 part-time employees on or about March 31. The Wisconsin State Journal reported that River City President Don Kwapil, in the letter to the DWD, indicated that the jobs lost will include 21 sales positions, 20 service representatives and 15 part-time merchandiser jobs. Kwapil founded River City, located at 1224 Clark St., in 1981. It has been a distributor of Budwesier and other Anheuser-Busch products and 19 national craft beer brands, including Goose Island. The State Journal reported that its Wisconsin craft beers include New Glarus Brewing Co., O'so in Plover, Tyranena Brewing Co. in Lake Mills, Potosi Brewing Co. and 3rd Sign in Waunakee. Last June, River City Distributing collaborated with MobCraft Beer, a crowdsourced brewery brewing monthly batches of beer submitted and voted upon by craft beer fans, to create Rhubarb IPA. MobCraft’s head brewer, Andrew Gierczak, developed the recipe based off the winning idea submitted by Richard Sjoberg of River City Distributing to incorporate rhubarb and hops. An energy drink appears to be behind the merger of two southern Wisconsin beer distributors. When the Coca-Cola Company in 2014 purchased a 16.7 percent stake in Monster Beverage Company, the multi-faceted agreement also made the soda company the preferred distributor of Monster. 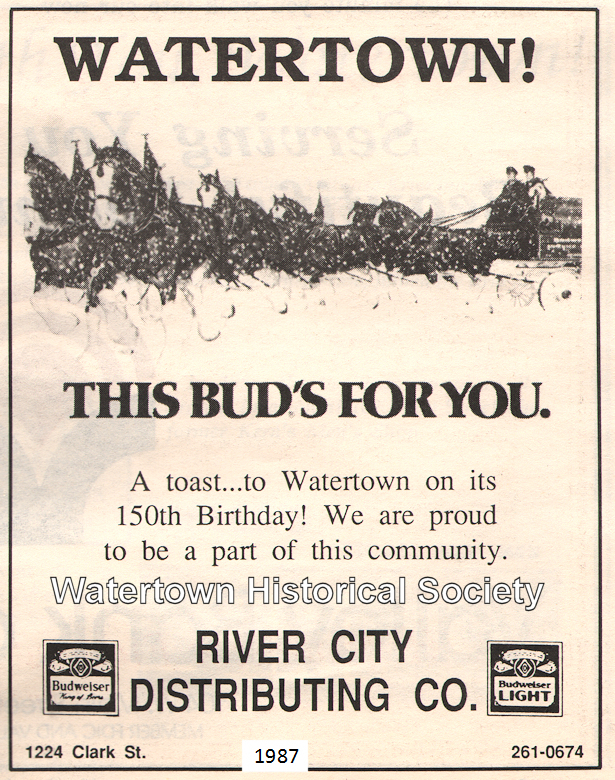 And in the case of River City Distributing, an Anheuser-Busch distributor in Watertown, the deal, which took effect for River City on Jan. 1, was devastating.